As an editor, I find myself noticing grammatical and spelling errors in advertisements, books and product packaging all the time. 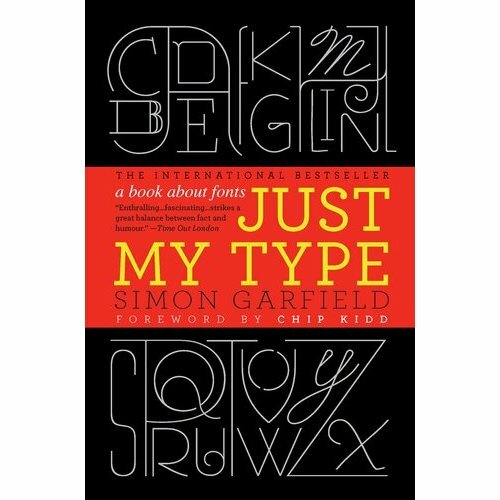 After reading Just My Type by Simon Garfield, I'll be noticing the fonts as well. Although I must admit, I won't be able to identify them. I don't think I ever realized there were so many different fonts out there! Garfield has taken what could be a very dry subject ~ fonts ~ and made it into an engaging book. I really enjoyed reading about the reasons why certain fonts were developed and how they satisfied specific needs, whether it be for street signs that had to be legible to drivers speeding down the road or newspapers that had to be easily read in small print. 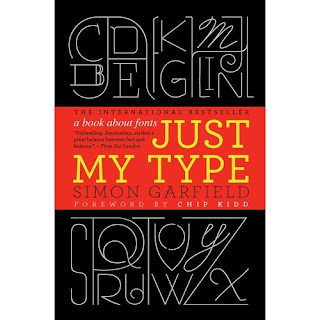 I also enjoyed reading about some of the people who have designed typefaces since the beginning, as well as the development of some of the fonts I know and use, such as Times New Roman, Gill Sans, Comic Sans and Verdana. Throughout the book, Garfield infuses humor and interesting facts to engage the reader. And the brief "Fontbreaks," in which he focuses on a specific font for a few pages, provide a glimpse into the way each font conveys a different feeling or characteristic ~ modern, feminine, traditional. Garfield continually reminds us that fonts really should not be noticeable. Rather, if it's a good font, doing its job properly, the message that is written in it should be noticed, not the font itself. If you are a writer or graphic designer or have any interest in design, I highly recommend this book. I work with many graphic designers and am going to personally recommend it to them. I think anyone who is responsible for choosing fonts for marketing or other materials would also enjoy Garfield's take on fonts. However, I will be clear that this is not a font encyclopedia. While Garfield does outline many fonts in some detail, you will not be able to identify specific fonts based on this book alone. It is more of an interesting look at the history and function of different fonts around the world. What type are you? Take this fun quiz to see what font best describes you. I'm Courier, by the way. I don't think I'll ever be able to identify most fonts but the history behind them does fascinate me! I'm glad you enjoyed this one - I'm looking forward to reading it myself. I always had a fascination with type fonts.